Sugar cream pie, or Hoosier sugar cream pie, Indiana cream pie, sugar pie, or finger pie, is simply a pie shell spread with layers of creamed butter and maple or brown sugar with a sprinkling of flour, then filled with vanilla-flavored cream and baked. 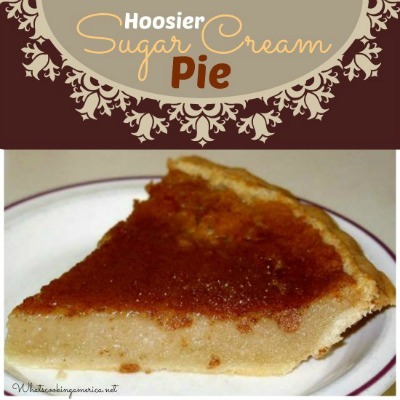 In the state of Indiana, Sugar Cream Pie is a favorite winter pie. Sugar Cream pie originated in Indiana with the Shaker and/or Amish communities in the 1800s as a great pie recipe to use when the apple bins were empty. This is classified as one of the “desperation pies” made in the winter time with basic staples from the farm pantry when you need something sweet. Somewhat similar pies can also be found in the Pennsylvania Dutch County and a few other places in the United States with significant Amish populations. The Shakers believed in eating hearty and healthy food. Sugar Cream pie was also know as “finger pie” because the filling was sometimes stirred with a finger during the baking process to prevent breaking the bottom crust. People used to skim the thick yellow cream from the top of chilled fresh milk to make this delectable dessert. Learn about the History of Sugar Cream Pies. Check out tips & hints on making the Perfect Pie Crust and also check out more great Pie Recipes. This is my mother’s recipe handed down from her mother who descended from a pioneer Quaker family. My mother uses the dry method and uses her finger for stirring. My mother told me that finger stirring in the unbaked crust is necessary so as not to whip the cream before baking. She sprinkles fresh grated nutmeg over the top before baking. Preheat oven to 450 degrees F. Prepare pie pastry. Place sugar and flour in the unbaked pie shell. Add cream and mix well using your fingers to slowly mix the dry and liquid ingredients (this prevents the cream from whipping). Add vanilla extract to the mixture and continue stirring with your fingers. Grate nutmeg over the top. Bake 10 minutes; reduce heat to 350 degrees F. and continue baking approximately 1 hour. Do not over bake. The pie may appear runny but usually sets as it cools. Over baking seems to break down the sugar and the pie never solidifies. If the pie doesn’t set, get out some spoons and enjoy it anyway. Although you may refrigerate the pie, it usually is not necessary to get it to set. Basically I use my mother’s technique with different ingredient proportions. I tend to get a more reliable result in terms of firmness. Place flour and sugar in the unbaked pie shell. Add cream and mix well using your fingers to slowly mix the dry and liquid ingredients (the prevents the cream from whipping). Add vanilla extract and continue stirring with fingers. Sprinkle with freshly grated nutmeg. Bake 10 minutes; reduce heat to 325 degrees F. and continue baking for approximately 45 to 55 minutes. Center will appear soft, but pie will set up as it cools. Do not over bake. Here is a recipe that uses half and half cream to make a cooked filling. This recipe is very reliable in terms of firmness. Preheat oven to 400 degrees F. Prepare pie pastry and bake according to the above directions. In a saucepan over medium heat, melt butter or margarine. Whisk in flour until smooth. Add sugar and half and half cream. Cook over medium heat, stirring constantly. Once the mixture thickens, pour it into the baked pie shell. Sprinkle with grated cinnamon and nutmeg. Bake for 10 minutes or until the filling is bubbly. Remove from oven.